Have a Happy & SAYF Summer! It’s summertime, and that means it’s time to go outside and enjoy the weather. The return of warmer temperatures brings thoughts of freedom, relaxation, exploration, and being closer to nature. Whether you’re relaxing in the backyard, turning up your garden, enjoying the pool, or exploring the great outdoors, here are some ways to help keep you and your family healthy this summer. Enjoying time with family and friends, outdoor grilling, and fireworks are all part of the 4th of July holiday weekend. However, sometimes the party is over before it starts. Binge drinking, defined as 5 or more drinks on a single occasion for men or 4 or more drinks on a single occasion for women, generally within about 2 hours, is a dangerous pattern of alcohol consumption. More than 15% of US adults report binge drinking. It is most common in men, adults in the 18-34 age range, and people with household incomes of $75,000 or more. Most people who binge drink are not alcohol-dependent or alcoholics. High blood pressure, stroke, and other cardiovascular diseases. Don’t spend the weekend in the emergency room as a result of binge drinking. Celebrate the holiday by keeping your family healthy and safe. For more information about binge drinking and the health effects associated with drinking alcohol visit the Alcohol and Public Health program site. Watch our video that debunks common myths associated with binge drinking. Nothing says summer like the smoky flavor of foods cooked out on the grill. When grilling, use a meat thermometer to ensure that you cook meat and poultry thoroughly. Ground beef should be cooked to an internal temperature of 160°F. Also, put cooked meat on a clean platter, rather than back on the one that held the raw meat, to avoid cross-contamination. Whether you’re cooking out in the backyard or on a picnic, always keep cold foods cold and hot foods hot. When you’re finished eating, refrigerate leftovers promptly. For downloadable tips, see Safe Food Handling: Seven Super Steps to Safe Food In the Summer on our partner site, FightBAC.org. 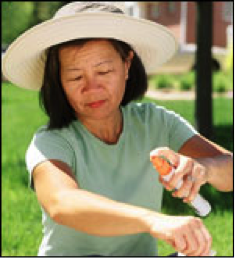 Warmer temperatures aren’t just attractive to people, but to mosquitoes, ticks, and fleas. Mosquitoes can transmit West Nile virus; ticks can transmit Lyme disease and other serious infections; and fleas can transmit plague. To prevent these illnesses, use an appropriate insect and tick repellent and apply it properly. Prime mosquito-biting hours are usually dusk to dawn, but ticks are out at all times. Young ticks are so small that they can be difficult to see, but both young and adult ticks hungrily look to animals and sometimes people to bite. To keep ticks at a distance, avoid tick-infested areas (especially places with leaf-litter and high grasses) and use repellent containing 20% DEET. You can also treat clothing with the repellent, permethrin, (which protects through several washings) or purchase clothing that is pre-treated with permethrin. Always follow the directions on repellent packaging. After coming indoors, shower as soon as possible and check your body for ticks. Make sure that your children also bathe or shower and get checked for ticks. Wash and tumble dry your clothing and check your pets for ticks. If you find an attached tick, don’t panic, ticks are easy to remove with a pair of fine-tipped tweezers. Consult your healthcare provider if you develop a rash, fever, body aches, or fatigue in the 1-3 weeks following a bite. It could be any number of illnesses. Pesticides, vegetation-free play areas, and landscaping techniques for tick-free zones can also help limit your exposure to ticks and other insects. Previous Post School’s out & the kids are home. This is an important time to clean out your medicine cabinet!